Having just returned from Belgium two weeks ago, it was great to hear Dries Van Den Broucke talk about the work being done on intangible cultural heritage in the Flemish community. Van Den Broucke works at the Arts and Heritage Agency of the Flemish Ministry of Culture. He is responsible for developing a policy on intangible cultural heritage in Flanders. Mr. Van Den Broucke also participated in the development of the Flemish Decree on Cultural Heritage of 2008. From 2000 to 2004 he worked for the city of Bruges as coordinator of the municipal heritage centre of excellence. He graduated as an Art Historian in 1997 at the University of Ghent in Belgium, specializing in Ethnic Arts. Van Den Broucke explained how ICH work has been unfolding in Flanders since the ratification of the UNESCO Convention in 2006. According to him, the Convention was easily ratified in Belgium. He attributed the ready willingness to ratify to the fact that both the Flemish and French community had sent experts to be involved in the early UNESCO ICH meetings. At the time of ratification, things were already happening in Belgium. Even though ICH wasn’t a known term, organizations were doing work that was essentially ICH-based. In the Flemish part of the country, there was already an existing act on popular culture and Flemish centre for popular culture. There was an extant organization that deals with tradition sports, other organizations that deal with puppetry, folklore, and regional products and recipes. One local organization seized on the idea of ICH, and built a website around the concept, based on a traditional game from the area: www.un-touchable.be. Belgium started in 2008 to nominate items to the Representative List of the ICH of Humanity, and started work on drawing up an inventory. Groups could apply for nomination to the national inventory, or to Representative List if they were ready. The national ICH inventory was kept very simple, with just the name of the tradition being nominated, and place where the tradition took place. In keeping with the goals of the convention, consent to be nominated is given through the application process. There is no complicated database, just a list, with paper and digital documents stored in the office. There was no large investment spent on making the inventory; the country opted to do the work in the easiest and cheapest way, but this still fits the requirements of the convention. I was intrigued to hear this, as it clearly demonstrates that an expensive, complicated inventory is not required for signatory nations (are you listening, Ottawa?). 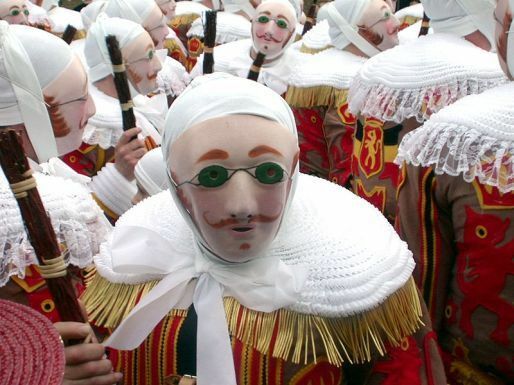 Currently there are 19 elements on the Flemish inventory, with six elements on UNESCO’s Representative List, including the remarkable Carnaval de Binche. Van Den Broucke argues that the Flemish public now understands the concept of ICH. The work done through their office means that heritage bearers are recognized for what they are doing, ICH has gotten positive press coverage, and they’ve seen positive effects for traditions and for the communities where those traditions are maintained. Recognition at the national level also helps local organizations with their own fundraising. Not surprisingly, Van Den Broucke said that the “usual suspects” came forward for nomination, namely well established processions and festivals. He spoke of the difficulty in reaching groups who do not think what they are doing is “intangible cultural heritage,” but said that there are a few items in the list, such as Flemish sign language, which speak to less documented traditions. One other issue he raised was the concern that groups thought that nomination was the pinnacle, but Van Den Broucke argued that nomination is not the end, but the beginning, of the process of safeguarding. Van Den Broucke said that one of the goals of his organization is to help develop sustainable policies for ICH. It is the job of communities to keep traditions alive; it is the job of government supports them. Government plays a facilitating role, helps to make sure that good practices are developed and shared, and gives local groups the knowledge to safeguard and transmit local culture. Nice to read about network of intermediate organizations. I think you did a great job writing this.